UK Timber Limited are one of the UK's leading hardwood decking suppliers that offer a nationwide delivery service that covers all areas of mainland UK. We have extensive on-site production facilities to enable the machining and finishing of our range of decking products from mainly domestic timber. 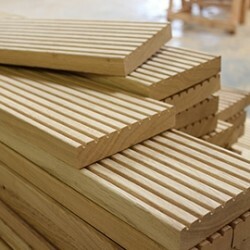 We also offer home grown timber treated softwood decking joists that we mill on site! Here you will find everything you need to create that perfect area in your garden for entertaining, for the kids to play or a base for a suntrap terrace or a hot tub! Being in charge of production from the tree to the finished article gives us complete product control and the quality of the finished product will stand as witness to our tried and tested production methods - beautiful decks require beautiful decking! 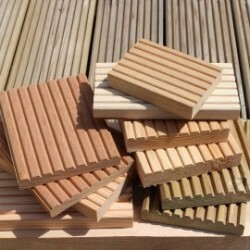 Our garden decking is available in various hardwood and softwood species, such as English Oak, Yellow Balau, English Larch, Siberian Larch and Continental Redwood, allowing us to offer what we think is the most complete range of garden decking in the UK! 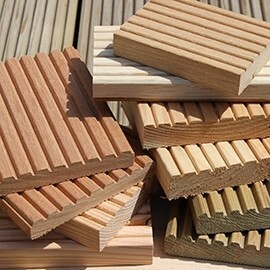 If you're a first time DIYer looking to improve your own garden or a professional looking for a high quality decking solution for use on a clients' project, we also offer a range of flat packed softwood decking kits, as well as a range of softwood and hardwood decking tiles at unbeatable prices! In addition to our range of decking boards, joists and decking kits we stock most components for those finishing touches to your deck. A good looking, properly finished deck can add substantially to the value of your home. 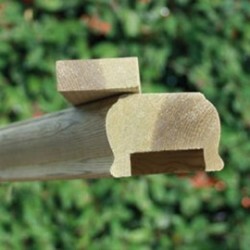 Here you will find spindles, hand and base rails and ready made complete panels for speed and ease of fitting. Taking good care of wood in exterior applications is of paramount importance as it not only provides protection to your decking but it will also enhance its natural beauty and feel. By protecting it from the elements you'll also be increasing its resistance against rot, decay and insect attack. 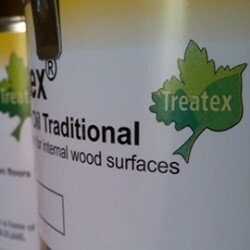 UK Timber works closely with the Treatex brand to provide you with a range of products that offer great value for money without compromising on effectiveness or quality. Our team of trained staff will be able to advise on the most suitable product for a particular job whether it's protection for decking, general-purpose wood enhancer, or where extra durability is key. Please feel free to contact us on 01536 267107 for any guidance you may require. We have been in the industry for many years and have built up a reputation for our quality decking boards at affordable prices. We are one of the UK's leading hardwood decking suppliers, offering a vast range of treated and untreated decking boards to both trade and the public. Our decking boards are available in various hardwood and softwood species, such as English Oak, English Larch, Continental Redwood, Yellow Balau and Siberian Larch - allowing us to offer what we think is the most complete range of decking in the UK. We have extensive on-site production facilities to enable the machining and finishing of our range of decking boards. Being in charge of production from the tree to the finished article gives us complete product control and the quality of the finished product will stand as witness to our tried and tested production methods. All of our decking boards are offered in various lengths and section sizes, with the choice of either a bevelled-edge non-slip profile or smooth. If a finish is not stipulated then a bevelled-edge non-slip profile will be supplied as standard. Not only do we offer a complete range of timber garden decking boards, we also offer a nationwide delivery service that covers all areas of mainland UK. Our large fleet of craned vehicles facilitate fast and convenient deliveries at subsidised prices! Whether you're a first-time DIYer looking to improve your own garden or a professional looking for high quality flat packed decking kits for use on your clients' projects, here at UK Timber we have developed a range of easy to assemble decking kits for you at unbeatable timber decking prices! These are full decking kits, so there is everything you need to complete the job, including detailed fitting instructions for ease of fitting! FREE DELIVERY ON ALL DECKING AND PATIO KITS! Here you will find a full range of decking components to help build your deck and to add those all important finishing touches, such as spindles, hand/base rails, pre-fabricated spindle panels, newels and decking joists in various sizes and timbers. 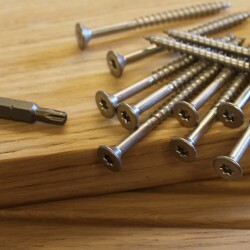 Here you will find a selection of decking screws suitable for use with all of our hardwood and softwood decking boards, both treated and untreated, as well as decking screws suitable for composite decking and for use in saltwater applications.